Experience Scotland in a day through this tour, which takes in some of Scotland’s most legendary heroes and finest scenery. 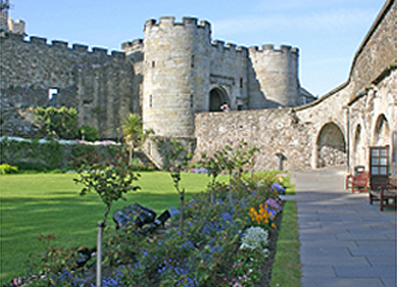 Driving through the country’s historic heartland, you’ll enjoy the scenic grandeur of forests, lochs and mountains as you visit the old stamping grounds of Rob Roy, William Wallace and Robert the Bruce, including the medieval stronghold of Stirling Castle. This most picturesque area of Scotland has been a tourist destination for over 200 years, having been made famous by Sir Walter Scott’s ‘Rob Roy’ and ‘The Lady of the Lake’. The Gaelic translation of the word ‘trossach’ is ‘rough area’, and much of the area is particularly hilly, with numerous small hummocks covered in oak trees. 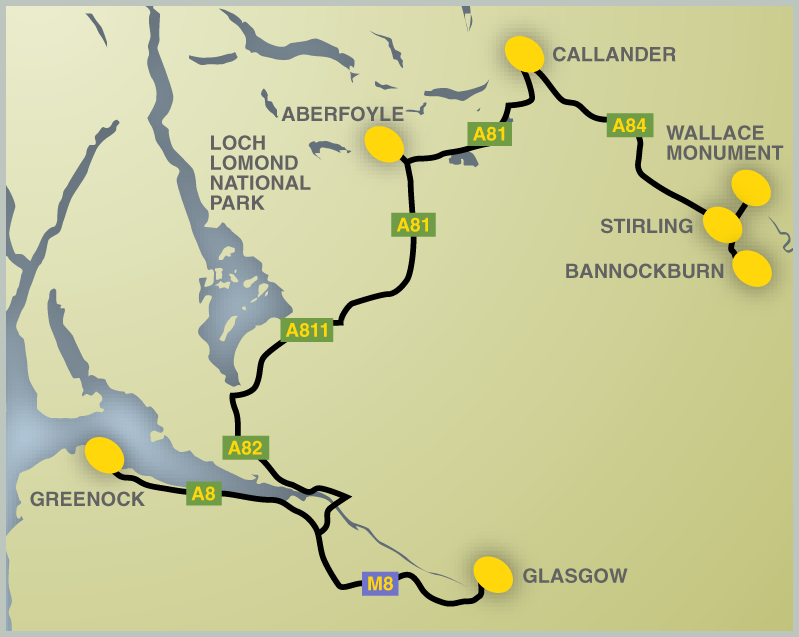 From Loch Lomond we will make our way to Aberfoyle and on through memorable scenery of hill and loch to Callander. On the River Teith, the town serves as the eastern gateway to the Loch Lomond and the Trossachs National Park, and is often referred to as the ‘Gateway to the Highlands’. The former St. Kessog’s Church there is now the Rob Roy Centre, telling the story of the legendary Scottish warrior and also offering lots of useful tourist information for the area. Dominating the town to the north are the Callander Crags, a visible part of the Highland Boundary Fault. Callander achieved prominence during the 1960s as the fictional village of “Tannochbrae” in the popular TV series Dr Finlay’s Casebook. From Callander, we travel on to Stirling where the magnificent castle dominates the landscape. For centuries this was the most important castle in Scotland. To the north is the 220ft high tower of the National Wallace Monument, commemorating Scotland’s great hero, William Wallace. From the castle ramparts you look out over the scene of Wallace’s greatest triumph, the battle of Stirling Bridge, where he defeated the English army in 1297. Most of the main buildings of the castle date from the fifteenth and sixteenth centuries, although a few structures date back to the fourteenth century. The outer defences fronting the town were constructed in the early eighteenth century. Several Scottish Kings and Queens have been crowned at Stirling, including Mary, Queen of Scots, in 1543. There have been at least eight sieges of Stirling Castle, including several during the Scottish Wars of Independence, with the last being in 1746, when Bonnie Prince Charlie unsuccessfully tried to take the castle. Entry to Wallace Monument and Stirling Castle require the appropriate fee at point of entry. Having explored Stirling Castle, we start on our way homeward, through Bannockburn. Robert the Bruce’s victory at The Battle of Bannockburn in 1314 brought the independence William Wallace had fought for and led to Bruce becoming the King of Scotland. In the Visitor Centre, the exhibition brings the Wars of Independence to life, with scenes of the coronation of Robert the Bruce and the signing of the Declaration of Arbroath. There are also figures of Wallace and Bruce, a large model of the Battle of Stirling Bridge and an audio-visual presentation which tells the story of Bruce and the battle. A photo opportunity not to be missed is the bronze statue of Bruce on his war-horse. This stands in the area where he killed the English knight Sir Henry de Bohun in combat, cleaving his skull in two with his axe. Entry fee to Stirling Castle and Bannockburn Visitor Centre applicable at point of entry. All timings are estimated and dependent upon road/traffic conditions. The Scottish Heroes standard tour costs £240 from Glasgow City Centre (£265 from Ocean Terminal, Greenock). The tour can be tailored to meet individual requirements on request. Costs are per five-seater taxi (six seater available on request). Entry Fee to any of the sites visits incurs the applicable fee at point of entry.